Many news sites are abuzz about the new Nokia offering in the form of an Internet tablet named N800. Previously, I had written about the Nokia N770 which is the predecessor of N800. 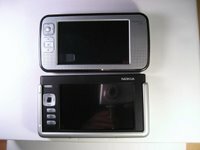 Nokia has reportedly added a number of enhancements to N800 which are lacking in its predecessor such as an integrated web cam, better style, enhanced hardware specs such as more processing power and more memory, two full sized SD card slots and more. But the one thing which attracts me to this mobile device is that it is powered by Linux. Price : Yet to be known. Already a number of people who are passionate about this new Nokia offering have shared their first hand experiences. The foremost being John Tokash who has provided a very good video of N800 which you can view here - do watch the video, you will be impressed. 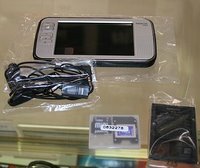 Also a person going by the pseudo name 'thoughtfix' has been blogging about all aspects of Nokia's internet tablet both N770 and the new N800 which also provides a lot of details about this device. Updates will be added as and when they are available.